Stained glass work by Moyalan Glass Works, Ollur, Kerala, based on the original design by Joy Elamkunnapuzha, CMI (2004) for the library at Vidyavanam Ashram, Bangalore 560 083, India. Posters: 17.75" x 10.25" / 45 cms x 26 cms. Note cards (blank inside) available in sets of 10 cards and 10 envelopes. 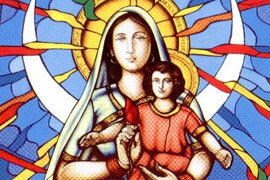 Clad in a sari, the traditional Indian dress, the Virgin presents her son, the Word incarnate, to the world. She holds a lotus bud in her hand, but the son's gaze is on the devotees, welcoming them with open arms. She stands on a pond with lotus flowers; the lotus, the national flower of India, prefigures in the ancient Sanskrit literature as a symbol of purity and seat of the Supreme Being; rooted in mud and mundane realities, the flower remains unstained and retains its resplendent beauty; similarly, by virtue of the immaculate conception, the Virgin became a pure dwelling place for the Divine Child. A peacock at the bottom left looks up in expectation; the figure of the peacock, the national bird of India, slowly transforms into multicolored rays of the sun; seven rays originate from inside the halo. The crescent moon, weaving through the rays, serves as a second halo to mother and son; it is a reminder of the Virgin's role as the reflector of the light of Jesus. Multilayered clouds in many hues merge with water, indicating the meeting of heaven and earth, and divinity and humanity in the person of the infant Jesus.